Willie may have been in the right place at the right time, but without his brilliant talent to accompany his imaginative ideas, we wouldn’t have the pleasure of reading his work. We are proud to celebrate Willie Perdomo on Day 25! The path to publishing children’s lit was without a doubt a matter of right time, right place. I was an assistant in the Subsidiary Rights department at Henry Holt & Co. Laura Godwin, publisher of Holt Books for Young Readers, got word that I was a published poet. One afternoon she stopped by my cubicle and asked me if I was interested in working with Bryan Collier. 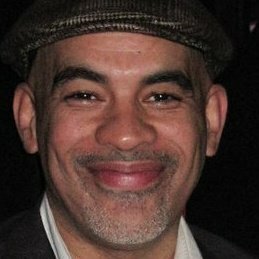 His first book, Uptown, was just published and I was really impressed by its richness. I told Laura that I would give it a try even though writing a children’s book was not on my radar. Later that week, I went to East Harlem to visit my mother and as I walked north on 5th Avenue, I walked past Langston’s brownstone and saw what I interpreted as a father and his daughter entering the house. The little’s girl’s voice came to mind, and I wrote the text in a few days. Laura wanted to buy the book instantly and she did. I was really lucky (and spoiled) to be paired with Bryan. Because I primarily write poetry, I don’t keep up much with the children’s book world. I work as a mentor for BookUp (National Book Foundation literacy program) and titles by Jackie Woodson and Nikki Grimes usually stir up some great discussions. I think Tony Medina’s early children’s work was really dynamic; it touched on issues rarely addressed in children’s lit such as kids with asthma, poverty, and homelessness. 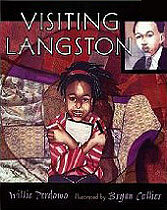 His Love to Langston was pretty comprehensive. Lisette Norman’s My Feet Are Laughing was a cool book. Of course, I’m a big fan of Bryan Collier’s work. R. Gregory Christie’s work as well. (I wish I could buy some of their originals!) Rita Williams-Garcia’s work is awesome; it always rings home. I also used to read Tony Dungy’s You Can Do It! with my son when he was in 2nd and 3rd grade. After I signed a contract for Visiting Langston, I had lunch with Laura Godwin and riffed off a few more ideas I had for a children’s books. Later that day, she offered me a multi-book contract. 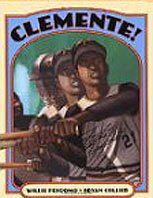 Clemente! was part of that contract. I wrote the text in San Francisco, almost seven summers ago. I didn’t look at the text again until Laura informed me that Bryan was ready to work on it. I totally revamped the text a few weeks before it went to proof. What’s in the book now is nothing like the original idea and I think the birth of my son had a lot to do with that. As someone who was new to the children’s book world, I was very fortunate in that the titles I collaborated on received either honors (Coretta Scott King for Visiting Langston) or awards (Amerícas Book Awards for Clemente!). For sure, working with Bryan was the biggest honor. I mean the dude has done projects on everyone from MLK to John Lennon! As far as reviews are concerned, I really can’t imagine a children’s book getting a negative review—but I’m sure it has happened. Most of the reviews for both titles were favorable. I can’t speak to the market forces that dictate children’s book publishing, but I do know that there’s a growing fear that kids stop reading for pleasure too early and that seems to be the biggest obstacle faced by teachers and I suppose publishers by extension. To keep up with Willie Perdomo, check out his website Willie Perdomo. I’m always gratified when people working in other genres cross over to YA and children’s lit – and we definitely need more poets in the house. Here’s to more serendipitous projects with Willie Perdomo!